The proso millet (Panicum miliaceum L.) is a cereal plant cultivated for its grain, mostly in Asia and North America. It is a warm-season grass with a short growing season and low moisture requirement that is capable of producing food or feed where other grain crops would fail (Baltensperger et al., 1995; Berglund, 2007). Proso millet is an erect annual grass up to 1.2-1.5 m tall, usually free-tillering and tufted, with a rather shallow root system. Its stems are cylindrical, simple or sparingly branched, with simple alternate and hairy leaves. The inflorescence is a slender panicle with solitary spikelets. The fruit is a small caryopsis (grain), broadly ovoid, up to 3 mm x 2 mm, smooth, variously coloured but often white, and shedding easily (Kaume, 2006). 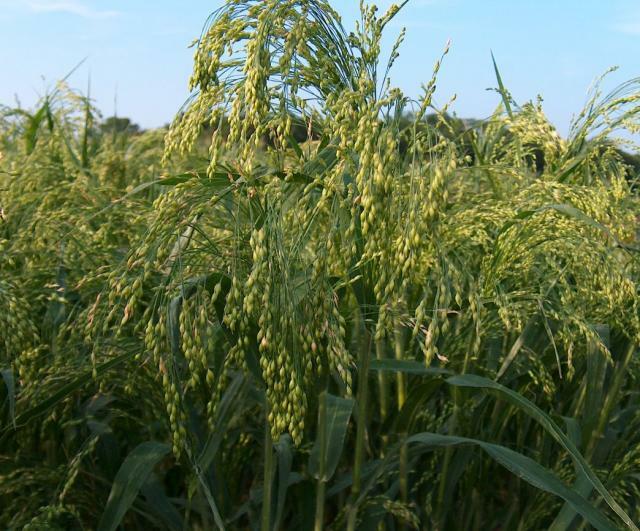 While mostly cultivated for its grain, proso millet produces enough plant material to be considered a forage crop. 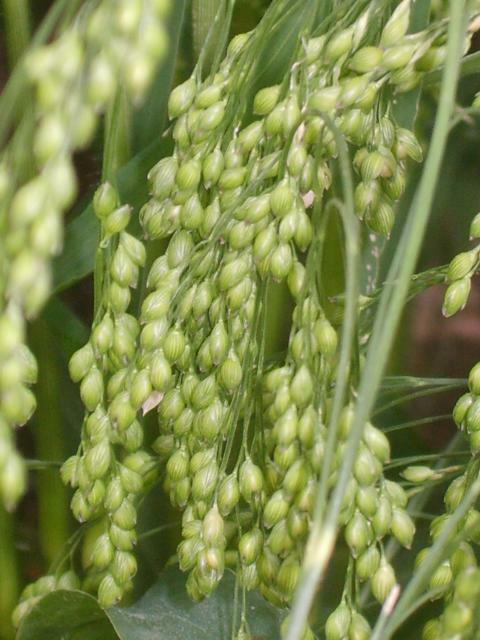 However, proso millet has a lower leaf-to-stem ratio than plants such as foxtail millet (Setaria italica), which generally causes it to be of lower quality. In the USA, it usually gives a lower forage yield than foxtail millet, and farmers generally prefer to grow the latter species (Baltensperger et al., 1995). The forage quality of the straw is poor, and in India it is more often used for bedding than for cattle. The straw is also made into brooms (Kaume, 2006). Panicum miliaceum may be a useful catch crop for emergency fodder (Göhl, 1982). Panicum miliaceum has been cultivated in eastern and central Asia for more than 5000 years. It later spread into Europe and has been found in agricultural settlements dating back about 3000 years. Panicum miliaceum is the Roman milium and the true historical millet. It was introduced into North America in the 16th century. Its popularity declined in Europe and the United States after the introduction of the potato and maize. It remains cultivated for human consumption mainly in eastern and central Asia, and to a lesser extent in eastern Europe (Russia, Danube region) and from western Asia to Pakistan and India. Panicum miliaceum is occasionally grown in other parts of Europe, Asia and in North America, mainly as a source of feed for pet birds and poultry, and as fodder. In Africa, it is cultivated in Ethiopia, eastern Kenya, Malawi, Botswana, Zimbabwe and Madagascar. It is widely naturalized, and is sometimes invasive, e.g. in the United States and Russia (Kaume, 2006). Panicum miliaceum is primarily a crop of temperate regions but it is very adaptable and can be grown in climates which are too hot and dry, and on soils which are too shallow and poor for successful cultivation of other cereals. It is cultivated further North than any other millet, the limit being the June isotherm of 17°C and the July isotherm of 20°C. Cultivation as a grain crop occurs up to an altitude of 3000 m in the Himalayas. It is susceptible to frost. Panicum miliaceum has one of the lowest water requirements of all cereals. An average annual rainfall of 200-450 mm is sufficient, of which 35-40% should fall during the growing period. Most soils are suitable for proso millet, except coarse sand (Kaume, 2006). Panicum miliaceum matures quickly, in 45-100 days. The vegetative phase is usually completed 16-20 days after sowing. From then it takes 20-25 days to flowering of the main culm, but this period is somewhat shorter at higher temperatures. The period from flowering to grain maturity has a duration of about 20-30 days, and is almost constant among cultivars. At grain maturity the lower part of the inflorescence as well as the stem and leaves are still green (Kaume, 2006). As a rotation crop, proso millet has the advantage of enhancing weed control, especially with winter annual grasses in winter wheat (Baltensperger et al., 1995). In North America, DM yields of proso millet forage had considerable year to year yield variability and are in the 5.5-7.4 t/ha range (Lang, 2001; McCartney et al., 2009). Proso millet forage should be harvested soon after the seed begins to fill to avoid loss of seed during harvest (Baltensperger et al., 1995). Proso millet cut for hay should be harvested when the crop is in the boot to milk stage (Berglund, 2007). Proso millet rarely provides sufficient regrowth to economically justify another hay harvest, and the regrowth should be utilized by grazing (Lang, 2001). Information about the composition and main nutritional attributes of proso millet forage is scarce and not very reliable due to poor identification of the forages in the literature. The protein content in the hay and fresh forage seems to be rather low (about 10% DM) with values as low as 5% DM and as high as 17% DM (or higher: a value of 23% DM has been reported for pre-boot, spring-seeded proso millet in Canada; McCartney et al., 2009). One report states that proso millet straw is of better quality than oat straw (Berglund, 2007), but available protein values are in the same range as other cereal straws. Fibre content is generally high (ADF more than 30% DM), but, again, literature data are extremely variable. Lignin content is low (5-6% DM) even in the straw. Proso millet is not extensively used for forage because the hairs on the stems and leaves cause irritation to livestock (Baltensperger et al., 1995). In Mongolia, oral injuries (stomatitis) and head fistulae caused by the awns carried on the spikes were common in equines fed proso millet straw. Mild cases usually recovered after removal of the awns from the mouth, but severe cases left untreated were fatal (Guang YaNong, 1981). Like other millets, proso millet may accumulate nitrates under conditions of heavy applications of N fertilizer and limited soil moisture. Because nitrate concentrations are in the lower 15 cm, it is recommended to leave a high stubble height when harvesting a drought-stressed crop. Hay curing does not reduce nitrate concentrations but ensiling can decrease them by 40 to 60% (Lang, 2001). In spite of the problems caused by hairs and awns, forages from proso millet are recognized as palatable and both hay and straw can be very useful materials for cattle and sheep. However, there is very little information about the use of millet forage for ruminants so it is difficult to provide a good overview of these forages. Proso millet straw was found to be more digestible than oat, barley or wheat straws and its EM value was estimated at 8.8 MJ/kg DM (Berglund, 2007). In steers, the DM intakes of fresh proso millet forage and millet hay were higher than for oat hay (101.4 and 96.8 g/kg W0.75 vs. 66.2 g/kg W0.75 respectively). In vivo DM digestibility was lower for proso millet hay (50%) than for fresh millet and oat hay (55 and 59%, respectively). The loss of nutritive value during millet haymaking was not very important (Gallardo et al., 1990). Feeding proso millet hays as 50 or 100% of the diet for pregnant heifers supported slightly greater foetal development than a control ration containing 50% maize silage, 24% alfalfa-bromegrass hay and 25% oat straw (Berglund, 2007).